For Vancouver-based makeup artist Lyle Reimer, their morning routine is a little longer than most. Tallying up an army of 93k followers on Instagram. 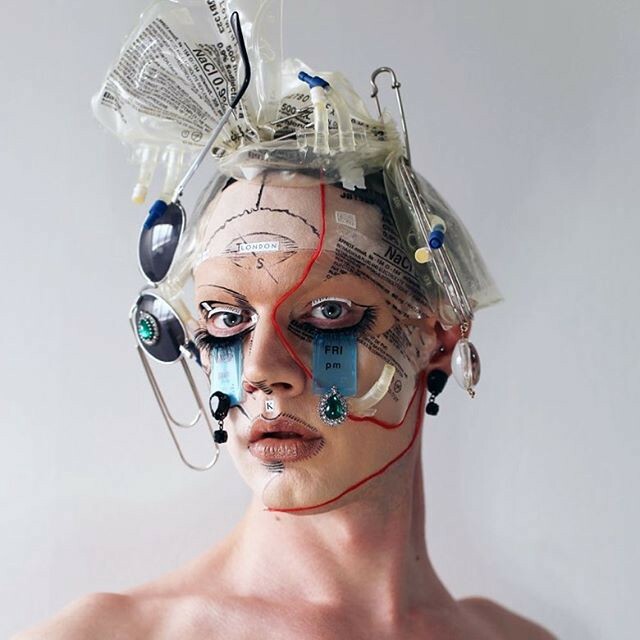 Reimer's makeup skills convert the banality of the object-world into a world of wonder. Reimer turns everything from raisin packets to extension cords into absurdly beautiful make-up armour. His looks formulate a language of disposability and waste, in which we can communicate a different definition of beauty with. Talk us through your process of creating a look from start to finish? I find it a bit challenging to describe the process of my work from start to finish; it really is all over the map and is a lesson in spontaneity. The one constant in “the process” is that I don’t censor the ideas. I believe that once you start questioning the idea or the inspiration, you begin to block the flow and the work starts feeling contrived and lacks authenticity. When I am not creating an actual look to be photographed, I am creating pieces to be used for future projects. I’d rather spend my time making a pair of earrings, styling a wig or making some form of facial adornment than watch a movie, so my work has just become a part of my everyday life. On a day when I have set time aside to create a complete look, then I have a body of work to pull from as I see fit in the moment. For example, if a pair of earrings made from saltine cracker packages is needed, then voila, there they are! A single look takes many hours to create because there is never a recipe or roadmap to follow. There are times when I just stare into the mirror for extended periods of time, and let my imagination go through a Rolodex of ideas before landing on something that feels right in that moment. As cliche’ as it sounds, the enjoyment comes through the process. After I have taken close to a hundred pictures of a single look, I promptly head to the shower and wash it all off. God only knows how much glitter has gone down my drain! Once I have returned to my former self, I sit down and grab a piece of paper and begin scribbling down all the random thoughts that come to mind to create the character’s backstory. The literary part of my work has become a key component, and I’m always happy to hear people comment about how much they look forward to reading the insane ramblings beneath the image. How did you develop your signature style of the everyday into art? After going to makeup school 17 years ago, I began taking the structure of the craft apart and slowly began to manipulate it. At first, I questioned myself, “ Is this really makeup, or shouldn't I be doing it another way?” Then as the years went on, I stopped asking myself and just embraced what felt natural and comfortable to me. I now feel like I have found my voice. I am obsessed with the concept of turning something, that to most is deemed “mundane” or “garbage”, and breathe new life into it. The more random, the better. 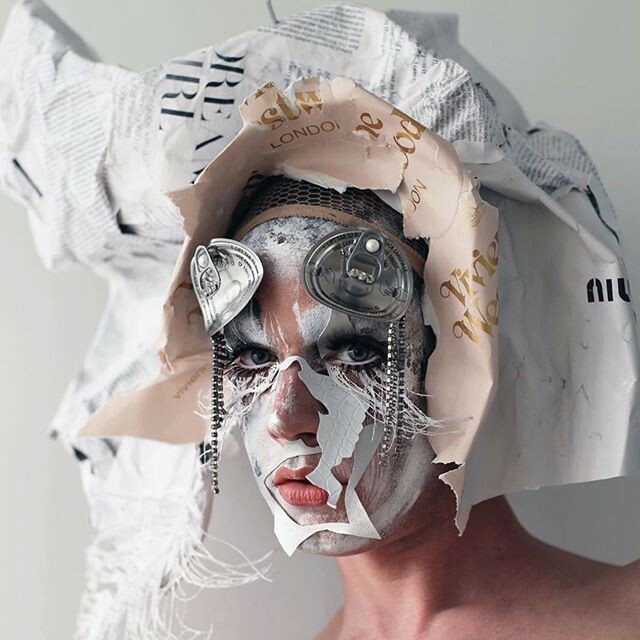 It is this pairing of recycled “couture” with the art of makeup that creates what I refer to as “mixed media facial sculpture”. People now send me packages filled with the contents of their junk drawers to create work with, and I have a room in my home that is solely dedicated to housing these contents. I colour co-ordinate bags of the “garbage” to bring a bit of order to the madness, so that my home doesn’t resemble something from an episode of “Hoarders”. Is there a message you’re aiming to communicate by translating trash into art? It was never a deliberate mission of mine to deliver a message through my work, however, I do feel that my art allows people the opportunity to view everyday life items and the contents of the trash bin in a whole new light. The adage, “one man’s trash is another man’s treasure” is a daily mantra of mine. In a world of disposable fashion and the eternal landfill, perhaps my work gives a tube of toothpaste or an outdated pair of Prada loafers one more romp before making their way to there final resting place. What opportunities have your skills brought you? I have been able to travel all over the world and work with amazing creative minds and meet so many incredible people. My work has taken me from New York to Tokyo, Paris to Taiwan, and many places in between. My family and friends joke about the amount of travel, and say they never can keep track of where I am. The day that Gucci contacted me for a collaboration was certainly a highlight, and getting a personal invite from Viktor & Rolf to meet them in Amsterdam to discuss my work were certainly moments that I never thought would be a result of my Instagram. Working with fantastic photographers on editorial content, giving talks around the globe to students or aspiring artists on my craft, and collaborating with brands all have been a total dream come true. I am beyond grateful for all the work and the busy schedule. I can sleep when I’m dead. Some comments on your Instagram range from "Your work is beautiful", to "This needs to be in Vogue." Do you personally view your ‘trashy’ looks as works of art in themselves? “Trashy” to me has a connotation of cheap and conjures up images of ill-fitting tracksuits in fuzzy pink fabric and over processed hair extensions. So, although I love to use 'trash' as a medium, I would much rather prefer the label of 'Art'. My life and my art co-exist and I can’t imagine one without the other.